La Caffe is a restaurant and cafe hidden away in the neighborhood near Wangsimni station. 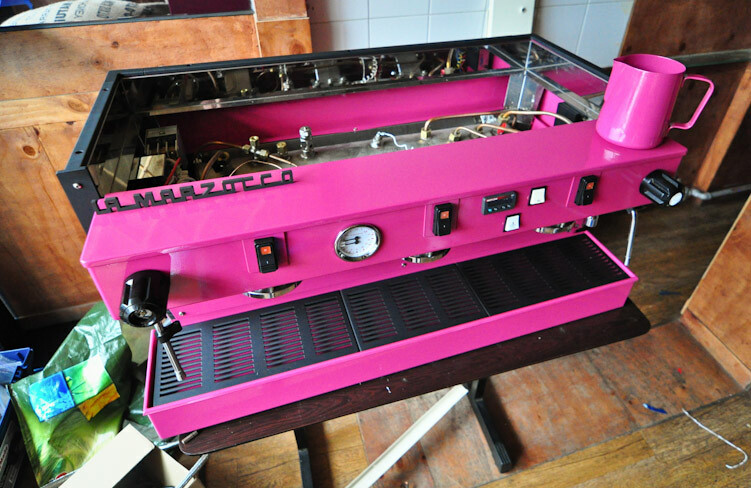 I heard that they had a Slayer espresso machine and made a point of visiting to see what all the fuss was about. 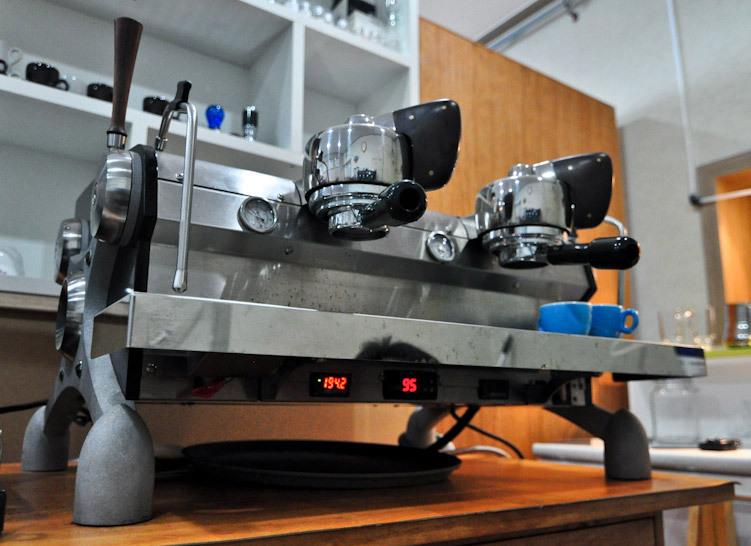 You see, the Slayer is a rather rare espresso machine hand built in Seattle, noted in particular for offering some degree of pressure profiling, and nice design details like wood paddles and an angled mirror that lets you see the extraction progress from the bottomless portafilters. Pressure profiling allows the barista to manually adjust the pressure of the water hitting the ground coffee during the course of the shot, and as you’ll see later it adds yet another variable for fine-tuning the taste of the espresso. If you want a little more info (and hype), try this New York Times blog piece, or this Serious Eats review. 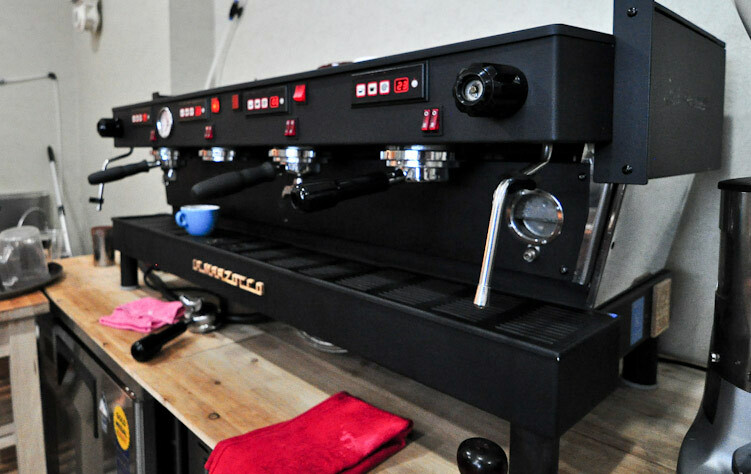 When I first visited La Caffe quite a few months ago, it turned out that the Slayer isn’t set up for daily use in the cafe. 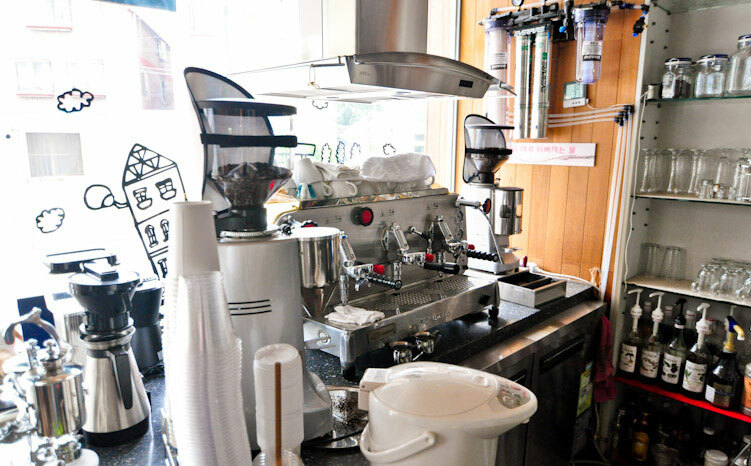 Instead, there’s a three group Faema E61 paired with what looks like Mazzer Robur and Major grinders that have been thoughtfully equipped with sunshades on the hoppers, hiding the beans from the afternoon sun. (Some of my photos are from the first visit, where there was also a Versalab grinder hiding in the back…). 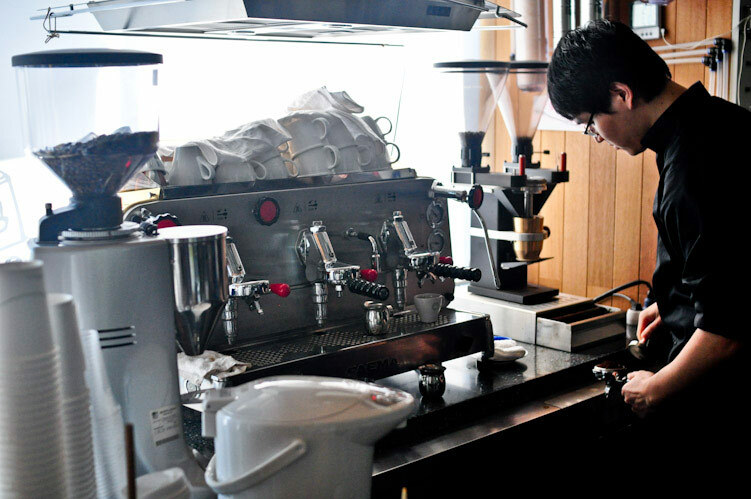 The espresso was unique and stood out from many that I’ve tried in Korea. The taste brought to mind lemon and salt, which may not sound nice but it was balanced and pleasant with a chocolatey finish and perhaps a hint of aromatic spices. I really enjoyed it and ordered two. 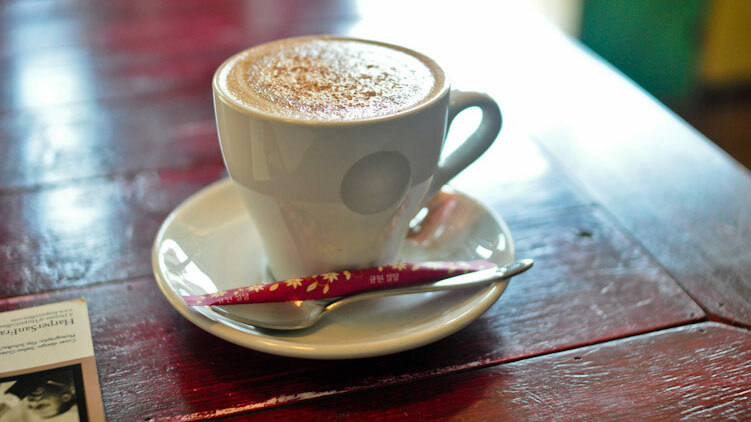 The cappuccino seemed prepared a bit more to cater for mainstream tastes, but I’m sure if you’re picky you could ask for something more traditional. The second time I visited I was happily surprised to meet owner Brandon J.H. Bang, along with an invitation to go up and see the Slayer. 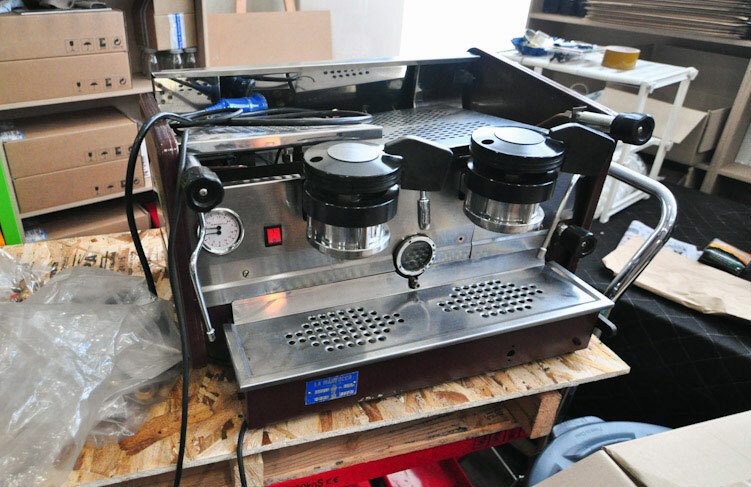 He has an enviable workshop, full of espresso machines under various stages of repair or modification, along with a few vintage pieces (like the La Marzocco GS2 pictured below) apparently being restored and/or customized with new internals. There’s also a vintage roaster (if you happen to know the model, please let me know in the comments). 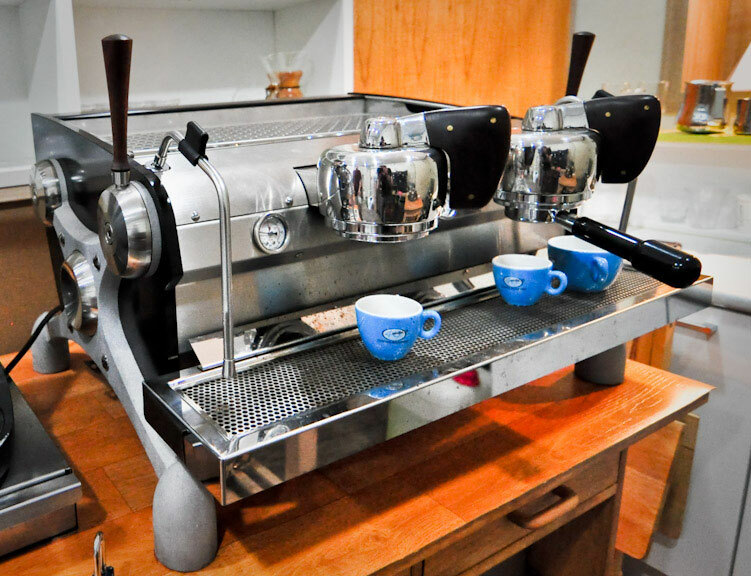 I was treated to a shot of La Caffe’s espresso blend pulled on his modified La Marzocco Linea, followed by the same dose/grind/portafilter on the Slayer with a custom pressure profile. The LM shot tasted like two distinct layers of flavor, like I had taken a bite of an orange, and then a milk chocolate bar; nothing to complain about there, tasted great. But then came the Slayer shot, which was much more integrated, smooth, and rich, like a tangy sweet orange chocolate mousse. 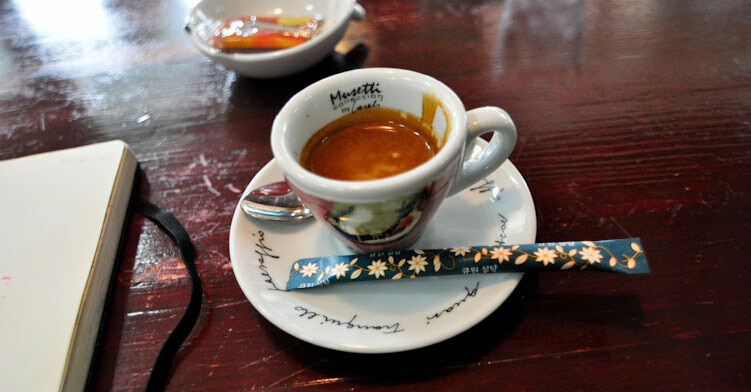 It was one of the best espressos I’ve had, without exaggerating. 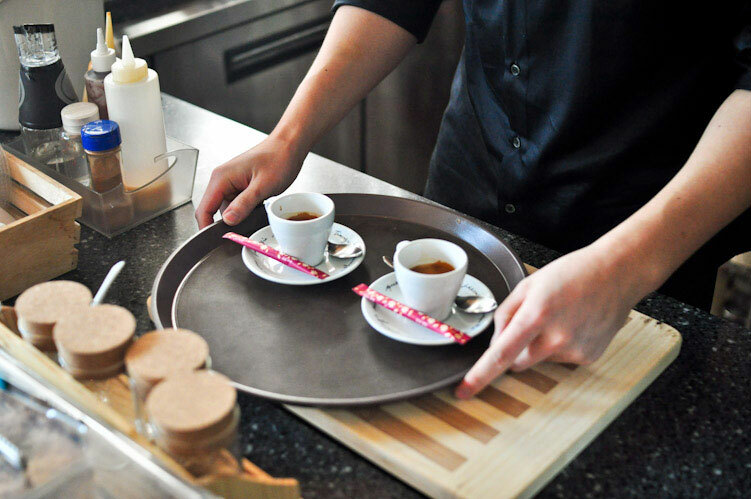 Pressure profiling lets the barista bring out different flavors by finessing the water pressure to highlight desired characteristics of each origin or blend. In the hands of a talented and focused barista that can mean an excellent coffee! While I can’t promise you a similar experience, I can say the coffee at the restaurant is quite good and the food was also nice, it’s worth a visit. It is a bit out of the way, but do stop by if you’re in the area. Exit Wangsimni station #9. Walk straight out the exit and follow the road as it curves. Walk for a couple minutes until you see a small road on your left, and turn left there. Then you walk straight on that road until you hit a small parking lot, which you cut through and then turn right and walk up the curving past a building with a ton of signs on it. It’ll be on your left. Yeah, it’s not easy to get to. Here’s a link to Daum.net’s map, which can do road-view if you need more recon before heading out. Love the pizza at La Caffe!!! 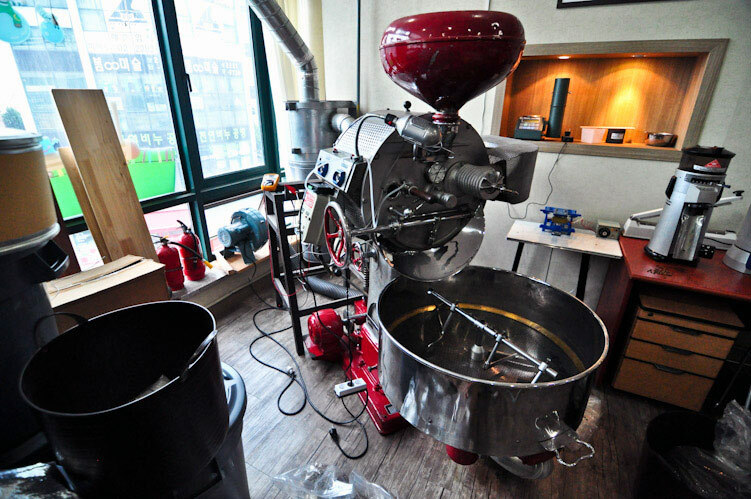 That’s not a picture of a similar roaster… that’s the exact same roaster! He bought it from Geir. Thanks so much for this post. You posted it on my penultimate day in Seoul and the mention of the Slayer made it too good to miss. We met Brandon, who is a top bloke and also showed us around his coffee lab, making it a truly classic coffee geek visit. Thanks to your blog we were able to totally indulge in some fantastic coffee shops; Caffe Themselves, Chan’s Espresso Bar, Coffee Factory, Coffea Coffee (Busan) and of course La Caffe as well as meeting some very interesting and enthusiastic people. I’ve made a wee post on a UK/European forum (toomuchcoffee.com) which you might be familiar with to spread the word of the Korean coffee scene. @Nick Cho — Thanks! I couldn’t remember the name. I was surprised at the capacity, seems like a smaller roaster than it really is. @Louis – My pleasure! Glad that you got a chance to meet some of the people doing specialty coffee, and tried so many different cafes! Sounds like you chose the best ones to visit. I used to work in this building where La Caffe is located. While I’m not a big coffee drinker most of my coworkers were hooked on their coffee. Pizza is amazing, and the caprese salad is to die for! I wrote a blog some time ago about this place. If you have a chance, check it out. Where does he keep all that machinery? It’s not in the restaurant, it’s too small! Lately La Caffe raised their prices. If you want to sit down and drink your coffee, tea, shake etc, it costs about 2,000 won extra. While I love this place, it’s enough to keep me from going often now. That amount of money adds up fast if you go several times a week. Big thanks to all our lovely customers. LaCaffe currently closed. We are renovating to cafe related business workshop, not cafe. See you soon with big news.